There are many things that can have a negative impact on your credit score. Over time it is possible to see this score decline as a result of one or more of these things. Many people are not aware of what their score actually is which an important first step in the repair process is. Having your score ran by one of the top providers will help you to understand what your status is. This is also a good way to put together a repair plan. Consumers often ask how does credit repair work because this is a complex issue. Consulting experts in the field is usually the best approach to getting this information. These are companies, such as Go Clean Credit that specialize in the restoration of credit scores. They can educate you about the meaning of your score and its implications. Along with this information, these are professionals who will develop a plan to repair the credit. These services also focus on instructing clients about better ways to deal with their credit over the long-term. There are credit repair companies in virtually every state in the country. These are experts in most instances when it comes to investigating and evaluating credit reports. There are times when you are unfamiliar with entries on your report. Most companies that perform repair services will run reports from all of the major credit bureaus. There are opportunities to remove negative entries as it relates to old and existing debts. The status of the report will impact the length of time a restoration takes. Working with the right credit repair company should benefit you for the future. The ultimate goal is to do more than remove negative entries. It involves preventing future damage to these scores. These specialists will show you how to adopt habits that will consistently maintain good credit. This involves paying debts on time, reducing the amount of credit you apply for. Both of these can result in reduced scores for consumers. The education component to these services is extremely important. Go Clean Credit assists their clients with setting goals for the future. These focus on short-term and long-term objectives. The ability to adopt better spending and credit habits is essential to these accomplishments. This restoration company helps by customizing a Game Plan that establishes ways to constantly build good credit. Their 10+ years of experience in this field works to benefit clients with an array of goals and with purchasing needs. Positive results build your overall creditworthiness. Studies have shown that the best recommendation is to review your credit score annually. This does more than show you what the score is. It allows you to determine if there are inaccuracies on the report. Experts say that 79% of the time, these errors exists on these reports. These can only be addressed and removed when consumers know they are there. Collaborating with repair professionals is the best way to respond to these errors effectively. They will work to represent you in a variety of ways. In some cases, this requires going after creditors for reporting errors. There are also times when legal documentation is necessary to repair credit scores. Each client’s situation will be different and may require different strategies. The time required to do this restoration work is crucial and complex. Investing in these services will help you to maintain your credit by applying better education and practices for your future. 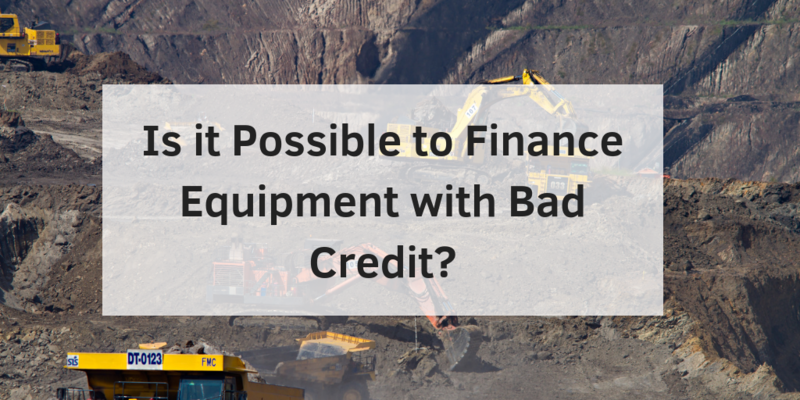 Is it Possible to Finance Equipment with Bad Credit? If you are a company that has bad credit and you are looking to finance equipment for your business you might be wondering if you will be successful in getting the right lease or loan? Bad credit can be defined as having a credit score between 550 and 620, which means you are a high credit risk to lenders. In order for you to finance equipment with bad credit, you have to prove you are not a high risk. You are able to do this by raising your score overtime or you can start by taking the negative information off of your report. Show that you have a better payment history over the past couple of months and you’re working towards being a better borrower. What’s better, a bank or an alternative lender? If you have less than a 620 FICO score, you are unlikely to be a candidate for a loan from a traditional lending institution like a bank. Equipment financing with bad credit, however, is much easier with alternative lenders, like Charter Capital. A lender like Charter is a better route to follow because they will have more lenient requirements. At one time or another, just about every active business will face the challenge of replacing an old piece of equipment or a software program or acquiring new widget machine to help keep their business competitive or to accommodate growth. These are good challenges to have. The challenge that’s not so good is figuring out how you’re going to pay for it. What you really need it to know what your options are and that’s where Charter Capital can help. When a customer applies for a loan or a lease, Charter creates an individual transaction profile that identifies all of the major decision components used by our lenders. We match that against profile against our Matrix to determine the best lenders for that customer’s specific need and present that information to our customer so they can make an intelligent choice. When a customer with bad credit asks for assistance the process is still the same. There are a few things you can do to lower your borrowing risk if you want to better your chances of getting approved. One thing you can do is show that your business is booming. If you can show that your business has been increasing over the past couple of months lenders may be more forgiving when it comes to bad credit. Another thing you can do is find someone who is willing to be a trusted cosigner. This person should be someone who has a better credit score than you because this will allow for a more desirable rate. Lastly, you can make a big downpayment from the beginning. Lowering the loan amount from the very beginning will show lenders you’re committed to paying it off quickly. Financing equipment with a bad credit score might be challenging, but you have the opportunity to improve your score in the process. Follow the simple steps to achieve a better credit score and in turn, you will prove you are not a risky borrower. I am trying to repair my credit, but it keeps on falling. What am I doing wrong? 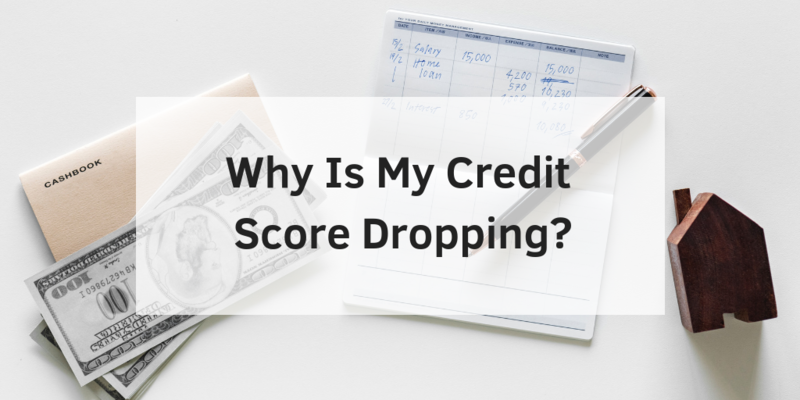 Why is my credit score dropping? Banks have their own precise terminology and ways of doing things that can be confusing to the Average Joe. You might be surprised to know that the Fair Isaacs Company (FICO) credit score was used for years before the financial industry told anyone about it. For some, the calculation method for credit scores is a bit arcane, cryptic and Byzantine. 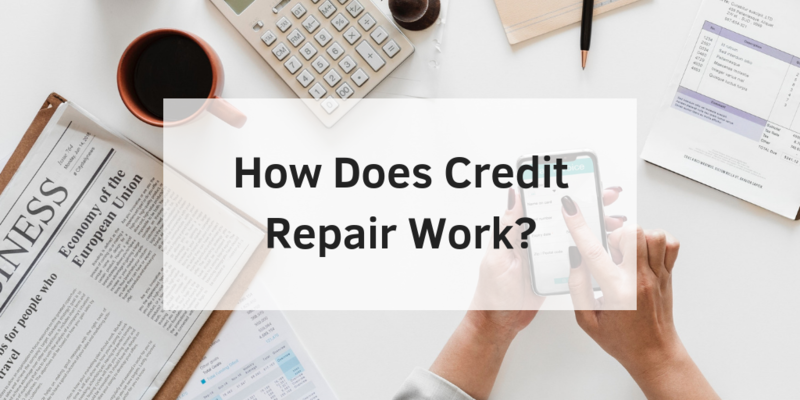 Some of these calculations are counter-intuitive; for instance, you might have very good intentions in repairing your credit, but your actions might be causing it to fall. What are some concrete examples of how this can happen? You might have worked diligently to pay off an entire credit card. Then, you might have closed the credit card account, thinking that your score would rise. Unfortunately, by closing your account, you have reduced the amount of credit available, so your score might drop. Sometimes, it might take time for a negative mark to be added to your report. A court might have issued an order that lowered your score. You should check your credit report every year. Here is another one that is counter-intuitive. Every time that you apply for a loan, your credit score might fall a little. Why? Banks believe that those who apply for loans regularly are having problems paying their bills. Financial institutions might see your loan application as a cry for help. You need to time your loan applications carefully. If you are trying to repair your credit, you might try to max out an entire account. Once again, this might not be the wisest decision. Your credit score dropping could be due to having too much debt on one account. The best course of action is to have 33% to 40% of credit available on each card. This makes it look like you are faithfully handling your financial responsibilities. Financial institutions keep very good track of everything that you do. Credit scores are vital to all facets of your life. Unfortunately, the arcane credit score system can be very difficult to comprehend. Fortunately, you can contact professional credit repair services to help you raise your score. 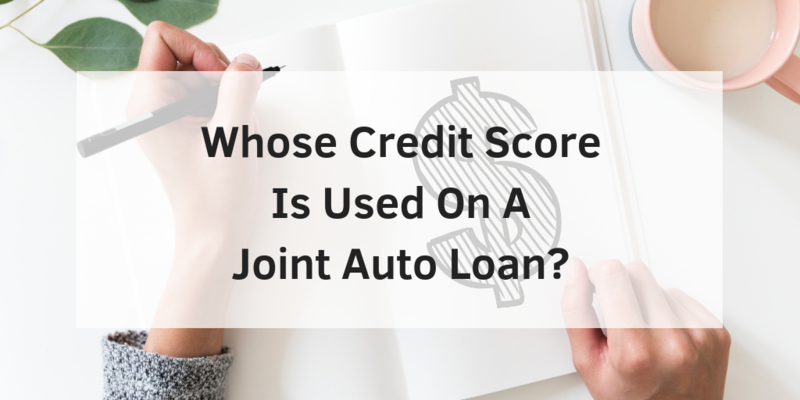 Whose Credit Score Is Used On A Joint Auto Loan? There is a multitude of reasons why someone may choose to apply for a joint auto loan. Some of those reasons include having poor credit, limited credit history, or insufficient income to purchase a car individually. Regardless of the reason, one seeks a joint auto loan, there are several questions will come to mind. The question of whose credit score is used on a joint auto loan is probably one of the most important. Incomes can be combined, but credit scores, unfortunately, cannot. The truth is that it is important for both parties to have an acceptable credit score and payment history. The lender is taking both applicants’ credit history and financials. Both applicants will be listed on the loan, car title, and will share responsibility for repayment. What are the benefits of getting a joint auto loan? A joint auto loan can help you get approved for a car loan you could not qualify for on your own otherwise. This can include a larger loan amount as well as a lower interest rate (APR). Lower interest rates on loans mean that you pay less interest over the lifetime of the loan. Is a joint auto loan the same as having a cosigner? The short answer is no. In some ways, getting a cosigner is like a joint auto loan. This is because in both cases it can help you get a loan approval. However, a joint auto loan means that both parties own the car and are responsible for repaying the loan. Joint auto loan applicants both share responsibility for damages caused should there be a car accident. A cosigner does not share joint ownership of the car, however, has a liability to repay the loan if the main applicant fails to make payments. A cosigner with excellent credit can improve your chances of being approved for a loan while allowing you to retain full ownership of your new vehicle. Can I remove a joint applicant or cosigner? If you improve your credit and financial situation, you can greatly increase your chances of getting an independent loan approval. You can re-finance auto loans and transfer to sole ownership if you meet the requirements to qualify for an auto loan on your own. Poor credit is not a lifetime sentence. There are several ways you can improve your credit history and credit score. The most important part is having the dedication to do what it takes. Your credit score is a golden number that can make you or break you when it comes to getting approvals for the things you want in life. Your credit score can be positive enough to get an okay on a car you always wanted, or it can be low enough to cause lenders to turn you down perpetually. 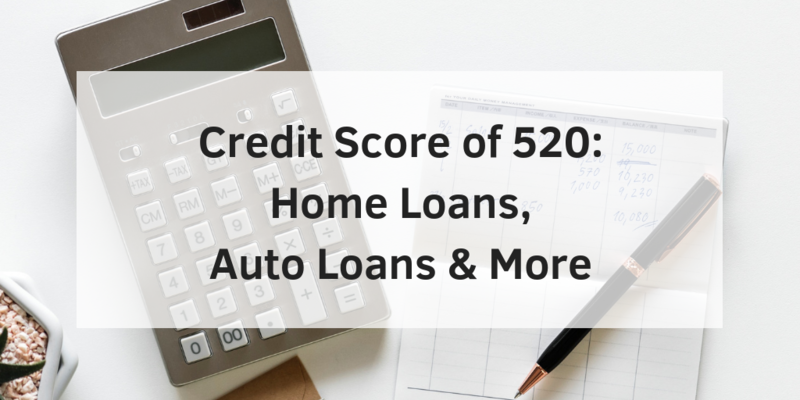 If you have a 520 credit score, you may qualify for some things, but the lending criteria will be much different for you than it will be for some other people. The following is some additional information about the 520 score. FICO is easily the most commonly used credit rating system that exists. If you have a 520 rating, it means that you are lower than the middle score between 350 and 800. The category that creditors will put you in at that point is the poor credit category. A score like that usually has a strong delinquency behind it. You can recover by getting some credit and then making faithful payments no matter what’s going on in your life. If you plug away for six to 12 months, you should see a significant rise in your score. Until then, you may have some difficulty getting the financial products that you desire at a rate that you can appreciate. A personal loan lender will approach your credit score in one of three ways. This type of lender may outright deny you. The second option that the lender may take is an option to request collateral from you. The collateral may be something such as a title lien that you allow them to get or a home deed. The other approach they may take is charging you an extremely high-interest rate. For example, you may get the loan, but your interest rate might be 20 percent as opposed to 6 percent. Car dealerships work with just about anyone. Your success depends on the dealership that you go to. You do want to get a car, but you don’t want to get into a deal that you can’t afford. Therefore, you must take your time, conduct thorough research and negotiate for yourself. You can start building up your score once you get the opportunity to utilize credit responsibly. Timely payments make up a huge portion of your credit score, so you want to make sure you make your payments swiftly, and you never get behind. One bad payment can push your score back many points, so you want to avoid that like the plague. A credit repair service can also help you to boost your credit and get back on the radar as a responsible payer. Experts who offer these services can help you get back on your feet and obtain the buying power that you once before had. Call for a consultation to see how they can assist you today. How Does Credit Card Limit Affect Credit Score? A large purchase has just come up, and you need to put it on the credit card. However, you’re very close to the card’s limit. In fact, this purchase may cause you to exceed your credit card limit. It’s important to understand your credit score and how it’s impacted by these spending habits. How does credit card limit affect credit score? Learn everything you need to know right now. The immediate impact on your credit is a drop in your score. If you spend even one penny over your limit, your score can drop 40- or 50-points. This point difference is huge if you’re considering buying a house or vehicle in the near future. Your credit score may not immediately drop because it may take your creditor a few weeks to notify the credit bureaus. During this time before the credit bureaus are notified, you may contact your creditor to clear up the issue before it is reported. 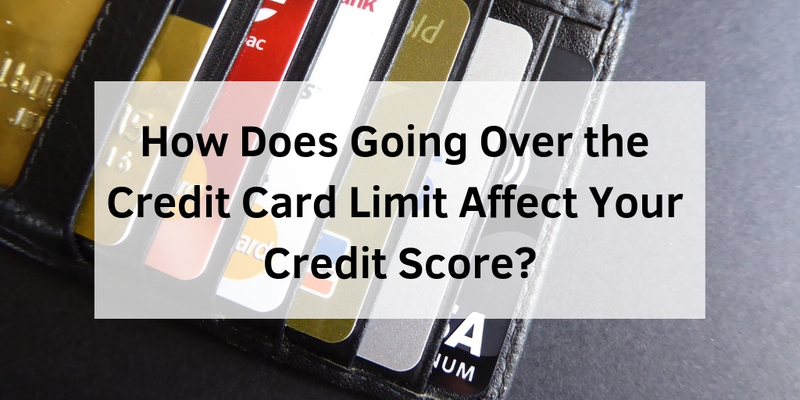 How does going over credit card limit affect your credit score? With industry terms, your utilization percentage becomes a problem. Utilization is the ratio of your card balance with the available credit. If you go over your limit, your utilization value is 100 percent or higher. The credit bureaus frown upon these numbers, and as a result, your credit score goes down. In some cases, overutilization will appear on your credit report. This permanent part of your record can be an issue in the future. Creditors will take several actions to rectify the situation. One action that they are sure to take is to charge an overspending fee. As a result, the charge may put you further into debt and increase your utilization percentage. Additionally, a creditor may lower your credit card’s limit. Consequently, having your credit limited lowered by any amount will make overutilization look worse than before. It is important to communicate your financial situation to your creditor. The promise of a payment in the near future may delay a creditors action against you. You may have overspent on your credit card, but it’s only by a few dollars. Regardless of the billing cycle’s date, pay down the card to get the balance below the limit. Late fees and interest will accrue from the moment that the charge hits the card. You don’t want those fees to accumulate either. They can be expensive over several billing cycles. Now that you know how does going over credit card limit affect your credit score. It’s important to understand that in order to resolve your situation by paying down your card’s balance as soon as possible. With this in mind, your credit score will improve with time. If you continue to find yourself meeting your credit card limit, consider requesting a higher credit limit. Your score will be slightly affected; however, it will positively impact your utilization percentage. Creating a budget is one of the simplest things that you can do for your credit score. It gives you a plan for spending less than you make. Although this scenario seems difficult, you can control your spending when you understand those limits. A better credit score will be your reward. Whether you forgot about a bill or didn’t have the funds ready to go, missing a credit-card payment is problematic for your credit score and history. Before you worry too much about this situation, get familiar with the steps that you can take to resolve it. 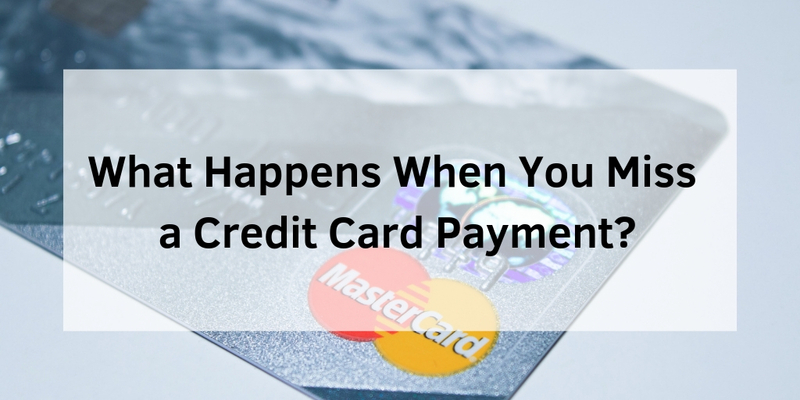 What happens when you miss a credit card payment? Several issues arise all at once. When you’re late on a bill, it’s considered late from the moment that the due date has passed. The penalty for a late payment at 30 days is much different than the 90-day type, however. Creditors understand that a missed payment after a couple of days may be a simple oversight. Everyone is human. If you go 60 or 90 days without paying anything toward the card, the creditors see this fact as a real aberration from your normal behavior. Fees are inevitable if you miss a payment. There are normally specialized fees for missed payments that can cost $30 or more. In addition to late fees, there are also interest charges. The interest charged on your balance may increase as well because of the accumulating fees. Be watchful of the fees impacting your credit limit too. If you are close to your credit limit, an overspending fee may apply to your situation. You’re welcome to ask for a refund on a late fee or other charges if you’re paying something onto the account right now. Be aware, however, that the creditor has the right to approve or decline your request. The only way to resolve your situation is by paying off the balance. The minimum payment may be tempting, but it amasses interest down the road. Take a look at your cash flow, and determine a reasonable payment plan. You may not pay down the balance this month, but you’ll be on your way to doing so. The accumulated interest will diminish too. Interest accrues daily; so, prompt payment is favorable. To protect yourself from any future missed payments, set up automatic drafts on your bank account. You pick the date and amount that will be drafted from the bank. Each month the payment amount will automatically be paid from available funds in your account. Your creditor may offer an incentive to keep up this automatic system, such as a lower interest rate or canceled late fees. What happens when you miss a credit card payment? Your credit history is forever changed. Obtain a copy of your history so that you can see how the missed payment affects your credit. Depending on the severity of the situation, your history will now have a negative mark on it. Look at your FICO score too. Your FICO score can drop as much as 50 to 75 points if the payment was egregiously late. Late payments warn creditors that you may not be responsible enough for another line of credit. If you make a habit of missing payments, it time to take a look at your financial situation. Paydays may not line up with your credit-card statements, for example. Call your creditors to set up due dates that match with your income. Most creditors will be willing to change the due date as long as you are able to make timely payments. Your credit score and history will be much better at the end of the day. It seems finances are tight for everyone these days. Strict budgeting, side jobs, and federal government assistance are widely used to alleviate financial strain. For most this is enough, but for others, a drastic measure like bankruptcy is needed to resolve a sticky situation. 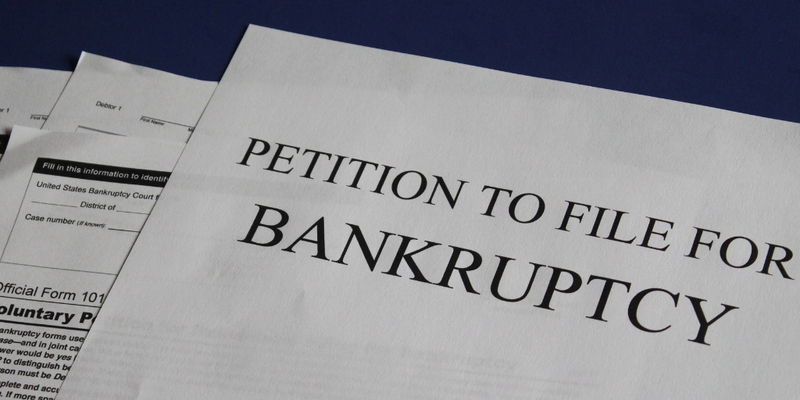 Bankruptcy is a viable solution for many but is often riddled with myths and misinformation. 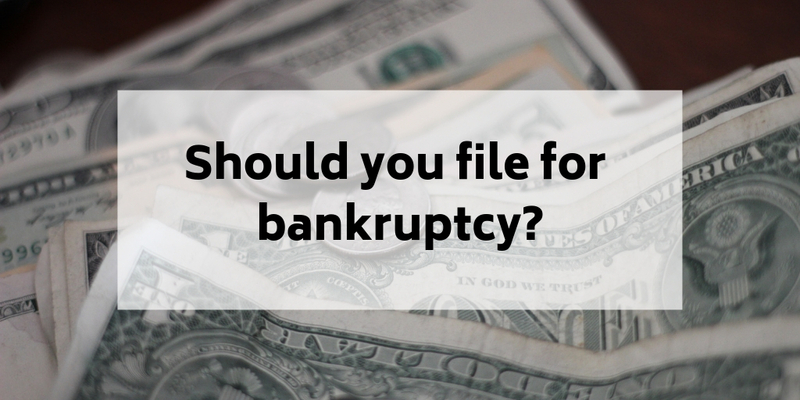 So, should you file for bankruptcy? We’ve explained the basics so you can decide. There are plenty of bankruptcy myths that keep people from considering bankruptcy as a solution. Will I lose all of my belongings? Will my credit score be ruined forever? These are all valid concerns and thorough research before filing for bankruptcy is needed to determine whether or not you should file for bankruptcy. There are two types of bankruptcy that individuals can apply for – Chapter 7 and Chapter 13 bankruptcy. Each bankruptcy takes into account personal debts and income and will have different effects on your credit. Chapter 7, known as liquidation, will force you to sell some non-exempt property in order to pay creditors. Because of the short duration of such bankruptcy cases, you should be able to begin rebuilding your credit in just a matter of months. Chapter 7 bankruptcies can stay on your credit report for as long as 10 years. Chapter 13, known as reorganization, will let you keep the non-exempt property and pay its value over a period of three to five years. Even more, you can steadily build credit with each on-time payment while the case is still pending. This type of bankruptcy will appear on your credit report for 7 years. Read More: What Happens For Your Credit When You File For Bankruptcy? Filing for bankruptcy is a big decision. It can resolve outstanding unpaid debts, and appease creditors; however, depending on your financial situation, the repercussions may not be worth the filing. These are only a few factors that people consider when deciding to file for bankruptcy. Despite this, it is ultimately, up to you and your financial circumstances. Why you shouldn’t file for bankruptcy? If you have not missed any payments, filing for bankruptcy is a bad idea. Bankruptcy can set you back significantly when it comes to your credit score. However, if you have missed payments on multiple lines of debt, then you won’t notice a big impact on your credit. Bankruptcy can make the path to fixing your credit much shorter. It can hurt your chances if you wish to work around money or get a security clearance. Administrators of financial institutions and high-security jobs view financial troubles as a vulnerability. They worry that someone with a history of financial issues will take risks that others wouldn’t. If a secured creditor has a lien on a house or a car, the property will revert back to them if a bankruptcy is filed. Bankruptcy can be a scary subject with a lot of unknowns, but it is a legal right and is considered a positive second chance for many people. Before taking the plunge talk to a bankruptcy attorney to find out if bankruptcy is the appropriate action for you. Americans are experiencing debt stress like never before. Much of this stress stems from a higher cost of living and stagnant wages. Consumers are paying very high proportions of their income for housing. Many households also must manage vehicle loans, high insurance rates, student loans, and other financial stressors. Employment has also taken on a temporary nature in many industries. The result is high debt loads that often become unmanageable. Bankruptcy provides households with the opportunity to bring their expenses down to a manageable level. Filing bankruptcy is a personal choice. It is not always the best solution for debt problems, but in many cases, it provides the only method for a household to regain solvency. If you are unable to keep up with mounting debts, understand that you have legal options under bankruptcy. These options release or restructure debts, allowing your household to afford the cost of living. Many people put off bankruptcy because of several common bankruptcy myths. Putting off bankruptcy because of these myths is always a mistake. When considering bankruptcy, it’s important to have a clear understanding of what property you are entitled to keep, the effect on your credit history, and the process for rebuilding your credit afterward. Misconceptions about these aspects of bankruptcy should not affect your decision to get out of debt. Here are the facts to dispel these bankruptcy myths. Many people have the misconception that filing bankruptcy means they must surrender all of their possessions. This is completely false. No bankruptcy requires you to surrender the shirt off your back. You are allowed to keep some of your property. In some situations, you may keep all of your property. The specifics depend on the debtor’s particular case and circumstances. To find out what property you are eligible to keep, it’s best to discuss your situation with a bankruptcy attorney. Here are several examples of property many bankruptcy petitioners are able to retain. If you own a home, bankruptcy can help you stop foreclosure and keep the property. Your lender is barred from continuing a foreclosure while your bankruptcy case is active. During this time, the foreclosure process is essentially frozen. You have the opportunity to reaffirm the mortgage debt if you wish to keep the home. The decision to reaffirm should be based on what leaves you in the best financial position after bankruptcy. It’s important to note that if you have home equity, the court could require you to sell the home. The proceeds would then be used to pay your creditors. Many states allow you to keep the home if equity is below a certain dollar amount. If you own a home, consult with a bankruptcy attorney before making a decision to file. You need to preserve your home equity if at all possible. Vehicle loans can also be reaffirmed. Vehicles without notes can be kept but only up to a certain value. Obtaining a new car loan after bankruptcy discharge is usually possible if you have the means to afford the loan. A bankruptcy attorney can advise you on the benefits and drawbacks of reaffirming a vehicle loan. Bankruptcy allows most people to keep their personal property. If you have especially valuable property, a court may order it sold to pay creditors; however, this would only apply to the specific valuable property. For example, a court may not allow you to keep the expensive art. The property you need for daily living will never be in danger. A bankruptcy attorney will interview you about what property you have and advise you if you can keep all of it, which is frequently the case. One of the most common misconceptions about bankruptcy is that your credit will be permanently damaged. Though credit scores sink after a bankruptcy filing, they usually rise after the conclusion of the case. Creditors consider you a better risk because you have discharged some or all debts. Another of the most common misconceptions about bankruptcy is that credit repair will take many years. In truth, your credit starts to improve as soon as the bankruptcy case ends. After bankruptcy, you can rebuild your score by using debt sparingly and paying all bills on time. If you need advice on bankruptcy, contact a bankruptcy attorney, who can dispel the most common misconceptions about bankruptcy and help you become debt free. What Happens To Your Credit When You File For Bankruptcy? Increasing your credit score can seem overwhelming and you might even think it’s next to impossible. But you don’t have to settle for a low credit rating, even though with a credit score of 530, you have some work ahead of you to improve your rate. Luckily, there are practical steps you can take to help raise your credit score. 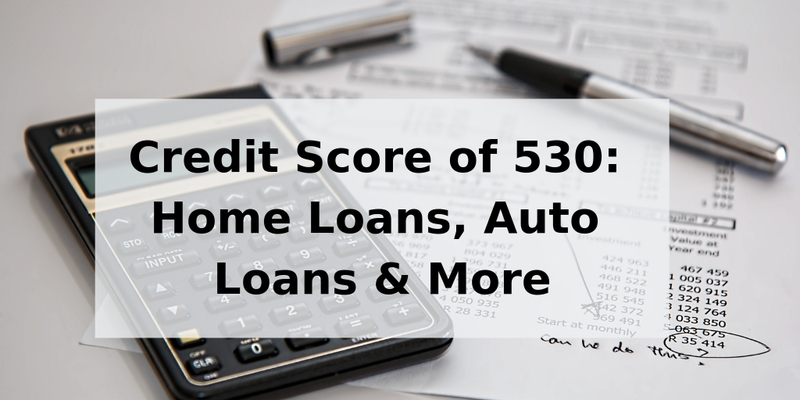 Let’s take a look at what you can expect with a credit score of 530 when it comes to credit cards and loans — and what you can do to boost your credit rating. Attempting to get a credit card with a credit score of 530 can be difficult. You might be lucky enough to get approved, but you can expect to pay higher interest rates. You might also have to put down a deposit before receiving your credit card. Another option you could take is getting a secured credit card with a reputable company. You’re required to put money down in advance, but it’s a great opportunity to easily build your credit score, and it can help you to make smarter financial choices. With a credit score of 530, you can expect to pay a pretty high annual percentage rate (APR) on an auto loan. You might have to provide a large down payment and the dealership could even require you to have a co-signer for added security. There’s the option of going to a “buy here, pay here” car dealership, but that doesn’t do anything to help build your credit. Plus, the amount you end up paying will be substantially higher than if you were to obtain a traditional auto loan. Buying a home with a credit score of 530 can be challenging. The Federal Housing Administration (FHA) offers loans with a 3.5% down payment to those with a credit score of 580 or more. If your credit score is lower than that, it increases to 10% for an FHA home loan. For example, if you wanted to buy a $140,000 home with a credit score of 530, your down payment would be $14,000. With an increase of 50 points to your credit rating, it would go down to just $4,900. Talk about a great reason to build your credit! Now that you know what to expect with a credit score of 530, you’re probably wondering how you can improve your financial life by increasing it, right? What you need is a simple, straightforward approach that gives you the opportunity to make small changes to improve your credit over time, and begin taking the right steps toward total credit recovery. You don’t have to tackle credit repair on your own! Give us a call today at 1-866-991-4885 to learn more about one of our affordable credit repair programs, and we’ll help guide you down the road to better credit in no time. Michael and Dawn McCraw are both passionate about helping good people change their financial lives. Every program is personalized to your unique situation and goals. Click here to see more About Us.